As a follow up to my last post on spruce tips bitters, I wanted to make a recipe to show how they can be used to flavour some baked goods. 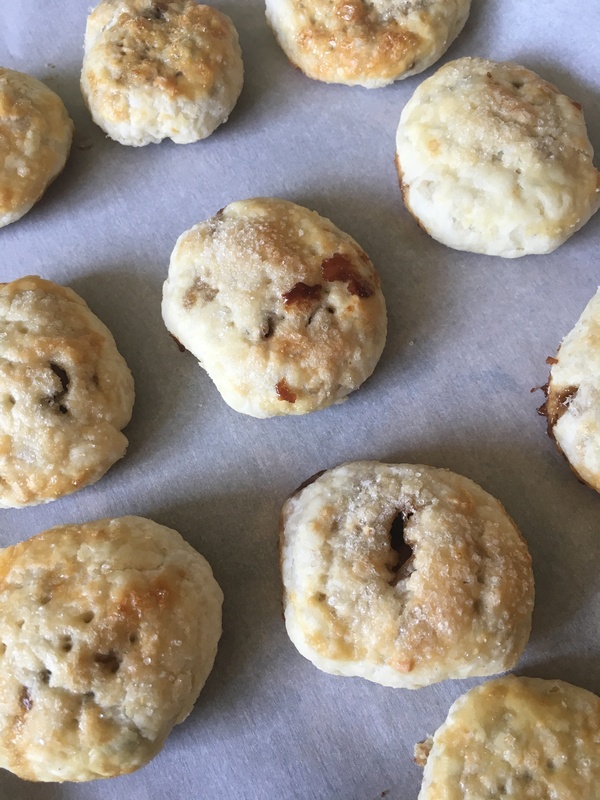 The first idea that came to mind is eccles cakes, and although not particularly seasonal, I think a good eccles cake has its own place any time of year. 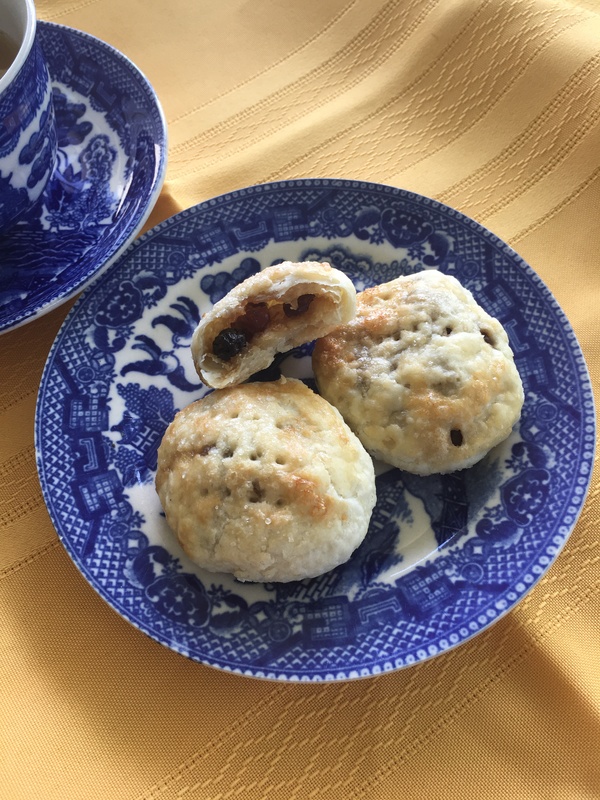 For anyone not familiar with these, eccles cakes are a cross between a tart and a biscuit. I have been using a very easy and reliable recipe from Davinia at Married with Cauldron, making some changes in the fruit and alcohol I use. While she calls for mixed berries, I have used a mixture of raisins and candied highbush cranberries. Instead of Jaegermeister, I’ve used spruce bitters. Feel free to use whatever combination of dried fruits you fancy! What I like about this recipe is that it seems to work every time, no matter what variations I make. Since I discovered that spruce and dried or preserved fruits are a perfect combination, I have favoured my spruce infused vodka, but I believe these bitters work even better. The spruce flavour is subtle once mixed with the fruit and baked in these flaky shells, but the overall effect is complex and surprisingly delicious. Prepare the pastry. Cover and let it rest refrigerated for at least half an hour. Heat the first four ingredients for the filling in a saucepan until the sugar has dissolved and the fruit expands and softens. Allow the mixture to cool before assembling. Roll out the pastry and cut into circles, about 2 or 3 inches in diameter. I made the smaller ones, which gave me 3 dozen cakes. Place some filling in the centre, moisten the edges with water and draw them up to seal. Flip them over and flatten slightly into a circle. Perforate the pastry either with a fork or by making three small slits in them. Brush with the beaten egg white and sprinkle with a little sugar. Refrigerate for 20 minutes. Bake at 350 degrees F for about 20-25 minutes until golden and crisp. 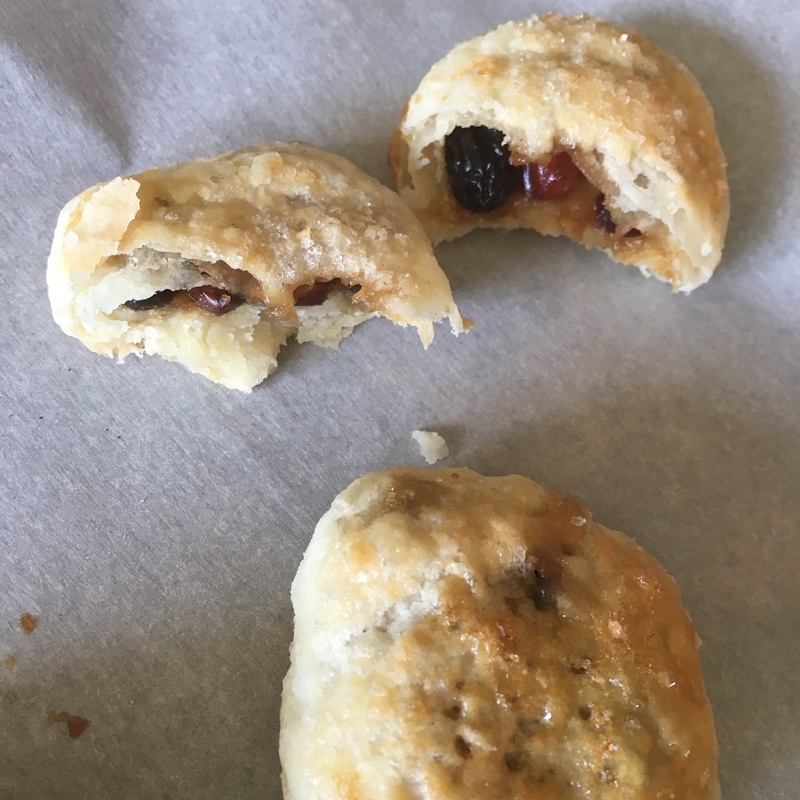 Thank you to Davinia for teaching me how to make the best eccles cakes, and so many other things on her beautiful blog. Thank you also to Angie, our gracious Fiesta Friday host and her co-hosts Suzanne at A Pug in the Kitchen and Monika at Everyday Healthy Recipes. Categories: baking, evergreens, wild fruit | Tags: eccles cakes, Fiesta Friday, highbush cranberries, spruce tip bitters | Permalink. So happy to have this recipe! I actually managed to pick a lot of spruce tips this Spring (since we’re thinking of downing the massive and precariously-leaning Norway spruce in the backyard). Most I pickled, and some I dried. They’re good!! I love eating them fresh even, straight off the tree! Thanks for the recipe! Thanks Angie. I find preserving them in salt and sugar is an easy way to preserve them, although the sugar needs some time to age and loose the bitterness. My absolute favourite method of preserving is to ferment some. They last indefinitely, and are as useful as pickles. Ferment? I’ll give that a try. I’m assuming you have the how tos on your blog? Not sure I do. But a salt brine (roughly 1 Tbs salt for 2 cups water) poured over some tips – brown papery bit removed, and leave around 5 days before refrigerating, although you could leave it longer according to taste. Very easy and very durable. yum yum yum! These look perfect for breakfast!